This may look like an empty lot just waiting for something to be be built on it, but at one time it was much more. It was a Toronto landmark, a place that anyone in Toronto could guide you to. 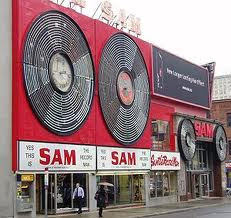 It was Sam the Record Man! Many out there now likely have never bought, owned or played a record, but before iPod's, and downloading, this is how people got their music. 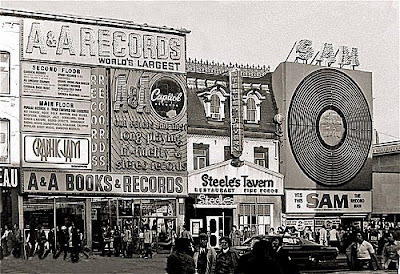 CD's were a marvel when they first came out and technology is moving fast, but when Sam Sniderman opened this store in 1937, the only way to bring music home with you was on a vinyl record. 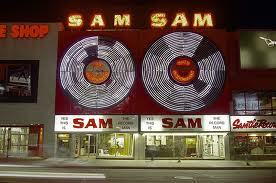 I remember going downtown to hit a few bars and always, always, we would end up here at Sam's. The place was always buzzing with people and when you went down to the basement, there were all the discontinued albums, a single hole punched through the corner of the album cover. People, myself included, would spend hours rifling through rows and rows of these in hopes of finding something unique, a piece of musical gold. Sam's went into bankruptcy in 2001. 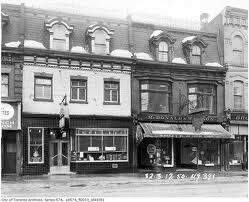 Sam's 2 sons, Jason and Bobby re-opened this Yonge St store the next year but closed it for good in 2007. It really was a sad day for many in Toronto. The whirling record lights were turned off for good. Well not for good. 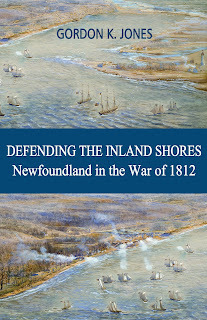 They came on the next year for Nuit Blanche. More importantly, Ryerson University purchased the site to expand the University. As the top photo shows, they are on there way to build a new learning centre. My hope was that the sign, which has been saved, would hang from the building and once again take there rightful place overlooking Yonge Street. I hear though that this is not true, although they are working to have the sign spin it's light s again somewhere. I sure hope so. Finally, one last shot of the same site before Sam the Record Man took it over.